1 Map has N Images. When a the user updates the Map data I do not make an update because then I lose the old data. Thus I do an Insert into the Map table with the same auto incremented Id but a new datetime stamp. This way I want to historize all changes on a Map in the user interface. If I have a PK with 2 fields my FK must also have 2 fields. But this does not work in my case because the CreatedAt date from table Images cant be the createdAt date from the table Map. How would you do the historical "update" ? This assumes you only want to version the map fields but not images. For images that didn't change: just copy the links but don't create new image versions. For images that did change: create new image versions and links. This way, you don't have to do expensive copying of the image content just because the map has changed. You only create a new image version when the image itself has changed. NOTE: This model is a little too general. It allows same images to be shared between multiple maps (not just multiple versions of the same map). Let me know if you'd like to restrict that. Note how we don't introduce any surrogate keys. 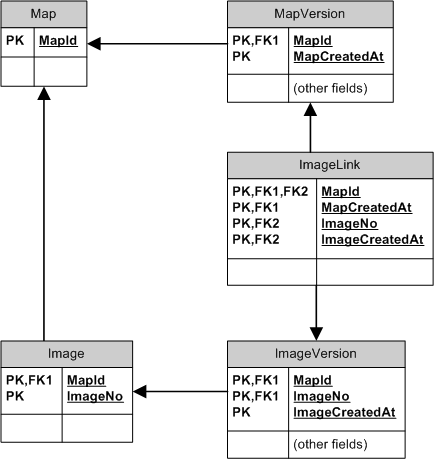 Instead, we let identifying relationships produce "natural" keys, which then get merged at the bottom of the diamond-shaped dependencies: ImageLink.MapId has foreign keys toward both "edges" of the "diamond"
If your primary key on the Map table is the single column Id, then your foreign key in the Images table is really just the column MapId, which references the Id column on the parent table. If the primary key on the Map table is the single column Id, then you won't be able to insert another row with the same value as Id. Inserting rows with specified value for an IDENTITY column can be done, but you have to do a SET IDENTITY_INSERT tablename ON statement, and then you have to remember to do a corresponding SET IDENTITY_INSERT tablename OFF statement. To achieve a history of the contents of the Map table, I would consider creating a separate "MapHistory" table to store the change history, and use a trigger to maintain it. With this approach, your code can be much simpler. 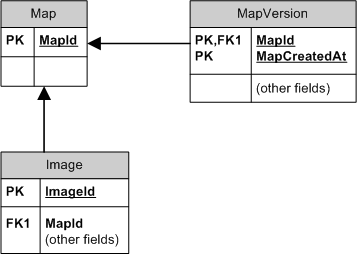 All you need to do is perform the UPDATE on the Map table, and the database will take care of maintaining the MapHistory table. One slight disadvantage of this approach is that now the "current" values are in one table, and the history of previous values are in another table. If you would rather have the current values also stored in the MapHistory table, you can modify the trigger to fire AFTER INSERT, UPDATE instead, and reference the special logical inserted table instead, so that you are creating a "replica" of the inserted updated row into the history table. It's also possible to store both the "old" and the "new" rows in the history table, but then you would really be storing redundant data. In that case, you'd probably want to include a column that indicates whether the row is from the 'Deleted' table or the 'Inserted' table. This approach allows you to have Id IDENTITY as a simple primary key in the Map table. I think the change_date column I added on the MapHistory table may be redundant, it may serve the purpose you intended for the CreatedAt column. I recommend create another table History where you keep all the last values including the actual, so you can have your table Map just with the key. [Id] [int] IDENTITY(1,1) NOT NULL You can do this with a trigger or with a procedure, insert the current record in the history table with the alter datetime and in the normal Map table you update the record. An alternative when you want to keep the old parent child relationships is to insert the old data into the new row and then update the old row to the new data. It may take three steps if you have unique indexes or other constraints that would affects there being two record alike except for the surrogate key for the duration of the transaction. Not the answer you're looking for? Browse other questions tagged sql sql-server database-design foreign-key-relationship or ask your own question.